The New York Yankees -- wearers of pinstripes, owners of the most identifiable uniform in American sports, and so wealthy their sleeves should come with gold cuff links -- nearly went down to defeat at the hands of the budget-conscious Athletics, who gave baseball yellow and green uniforms. Yes, it's true. The Yankees' famous NY logo was nearly beaten by the Athletics' elephant patch in a second-round matchup so close that Nate Silver could not have been able to call it. After a nip-and-tuck battle, the Yankees finally escaped with a slender 51-49 percent victory to advance to Wednesday's quarterfinals. It was a tough day for Bay Area fans, who lost another squeaker when the Giants lost 51-49 to the Pirates. It seems the Bay Area needs to expand its population base just a bit. 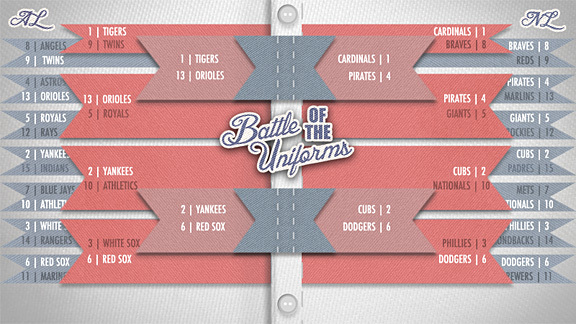 The rest of the battles were won by fairly wide margins, including the battle of the Soxes (Boston beat Chicago). 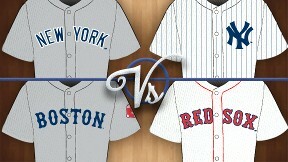 That sets up an interesting matchup with another battle in the never-ending Yankees-Red Sox rivalry. Good luck, guys, and remember: Bloody socks matter only if the voters can see them. 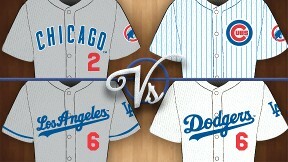 That isn't the only matchup of teams with old-school classic looks, though. The No. 1-seeded Tigers, who still are dressed roughly the way they were when Al Kaline was in right field, take on the Cinderellas of the bracket, the No. 13-seeded Orioles, who handily beat the Royals. Over in the National League, the No. 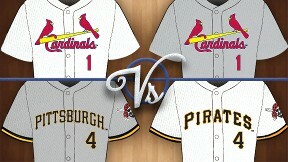 1-seeded Cardinals will take on the Pirates, with the Dodgers and Cubs going head to head. This has not been a great season for either Los Angeles or Chicago, but at least one of those teams will win this round. Who will advance to the Final Four? That's up to you. Polls are open until 9 a.m. ET Thursday morning. Will the Tigers eat the birds? 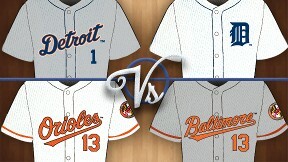 Or will the Orioles fly away to victory? So we have yet another battle between these bitter rivals. The winner of this battle may be the uniform with the fewest blood stains. Fun fact: Cardinals team president Bill DeWitt III is heavily involved in the team's uniform decision-making. Gotta love that level of passion! The Cubbies may finally have a championship within their grasp, even if it's only in the uniform bracket.